Ordering foot rail for your bar has never been easier or more cost effective thanks to our complete 8' Bar Foot Rail Kit in Brushed Stainless Steel. Each 8' Bar Foot Rail Kit comes with everything you need to install an eight-foot straight run of durable, eye-catching foot rail, including all necessary tubing, brackets, and end caps. All components in this kit come in Brushed Stainless Steel, which is a versatile, easy-to-maintain finish. You choose the hardware styles that best match your decor. Forget buying your foot rail components à la carte, which is time consuming and can result in misordered products. Order an all-inclusive 8' Bar Foot Rail Kit in Brushed Stainless Steel today! The bar rail kit came in excellent packaging and condition. Instructions were simple and cutting the 8’ rail to meet the desired length was easy with the right cut off blade. Highly recommend to anyone looking for a bar rail system indoors or out, which our is. 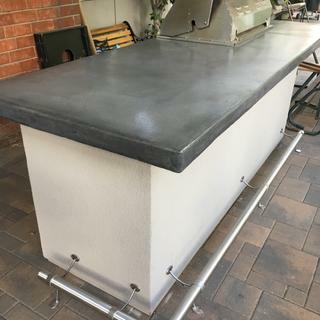 The bar rail kit went together very nicely and fit in great with our SS BBQ and concrete counter. Overall easy to install. Bought both 6’ and 8’ Bar Foot rail kits and everything showed up with no parts missing, although the rails were 1 week backordered. Happy with the look and getting nice compliments. Classy and goes well with the rest of my bar design. Only minor beef is the set screw to hold the bar in position. Self tapping screw included, but against brushed stainless steel a real challenge I have yet to tackle. Need to buy a cobalt drill bit to pierce the bar. Why not provide threaded holes in the combo bracket to allow a set screw as a cleaner alternative? High quality material that looks great! 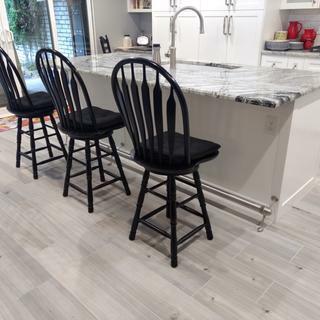 Foot rail makes it easier to get up on the counter height barstools. Sitting at counter, using foot rail, is more comfortable than bending my knees to rest on a rung of the barstool. Also looks great on the kitchen island! Love it! The foot rail makes it much easy to get up on the counter height bar stools. how high is the rail from the floor? BEST ANSWER: I have it sitting on a hardwood floor. The rail is just shy of 8 inches from the floor to the top of the rail. I have bar height stools so the average height person can rest feet on the rail. I had to cut a few inches off the 8 foot long rail to fit my bar. It cuts easily but make sure to use tape to wrap where you cut to avoid chipping the finish. The end caps slide inside the rail so if you chip the end it will show. I am extremely happy with the product. Looks great. The standard height of our bar rail brackets is just over 7" off the ground but that varies slightly depending on which style bracket you choose. If you use a bar mount bracket you can adjust the height to your preference. Typically, anywhere between 7-9" off the ground is recommended. can tube be cut down if needed? BEST ANSWER: Yes, you can cut the tubing to your desired length. For stainless steel tubing you’ll want to use a powered radial arm saw with a carbide tip blade. Be sure to file the stainless steel after you’ve cut it, to smooth the edge. Is the 8ft. Rail one full piece or spliced ? And does it ship to Canada ? BEST ANSWER: The tubing is one 8-foot piece. Unfortunately, they cannot ship to Canada as they are considered oversize by our international carrier. To ship internationally, we recommend purchasing 2 4-foot pieces and splicing them together. The seam will be covered by the center support bracket. Add a bar foot railing to your setup with this high quality, solid, stainless steel tubing. This extra-tall center post, brushed stainless-steel bracket is a perfect match for high bar stools, and can also be placed on a wall or bar facing.